I have been pondering last week’s subject, the most secret and magical name of the Sun God Re, which Isis learned when She forced Re to reveal it so that She could heal Him. Turnabout is fair play, so this time I’ll reveal some of Isis‘ most secret and magical names. These names are to be found in the texts that have come to be known as the Greek Magical Papyri, but which really should be called the Greco-Egyptian Magical Papyri. After all, most the magic is Egyptian and some of the formulae were even written in Demotic, which is a late form of hieroglyphs. Have I mentioned before that I love, love, love the magical papyri? In case you don’t know them, here a quick introduction. The Greco-Egyptian Magical Papyri, usually known simply as the Greek Magical Papyri, are a collection of magical texts, written on papyrus rolls in Greek and Demotic which date from the 2nd to the 5th centuries CE. I prefer to call them Greco-Egyptian rather than just Greek, for while they were written largely in Greek and they reflect a profoundly Hellenized Egyptian culture, they are actually from Egypt (the city of Thebes, modern Luxor) and the magical techniques they employ are almost purely Egyptian. First published in English in 1986 as The Greek Magical Papyri in Translation including the Demotic Spells and edited by Hans Dieter Betz, the Magical Papyri are an anthology of ancient “books” and extracts from books which were translated by an international team of scholars. 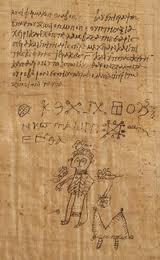 An example of what the Greek Magical Papyri look like. The information contained in these texts is extremely rare—a legacy of the coming of the Christian era. Magical books and records, such as those in the Papyri, were systematically destroyed as the Christian religion gained power. Before the discovery of the Papyri, many historians held a distorted view of the role of magic in the everyday lives of the people. That is, they believed that it didn’t have much of a role except among very “primitive” people— which the classical civilizations decidedly were not. I have also read authors who seem astounded that most people didn’t seem to differentiate between “magic” and “religion”. (Ancient Egypt is an example of a culture that didn’t make such a distinction; the ancient Egyptian language didn’t even have a specific word for religion. It did have a specific word for magic: heka.) With the discovery of the Papyri, and an increased respect for ancient religions among scholars, many have reassessed their views. Now it is more commonly accepted that magic probably had a larger role in people’s lives than previously thought and could even have been an expression of religious feeling. For modern magical practitioners, the Papyri are important, too. The spells contained in these Papyri (and others like them now lost) are almost without doubt, the source documents for medieval and hence modern magical workings. 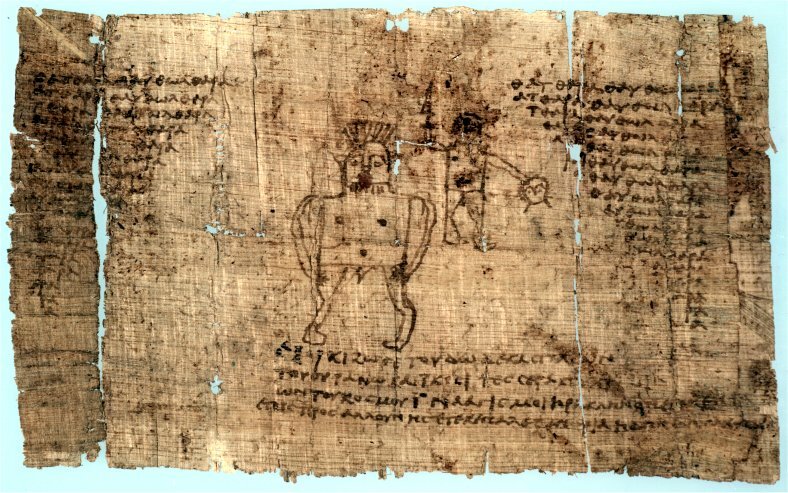 The Magical Papyri contain formulae for summoning spirit helpers, attracting lovers, creating prosperity in business; as well as many, many workings for divination of various kinds. One has only to compare the texts of the Magical Papyri workings with the texts of medieval grimoires such as the Goetia of the Lemegeon, the Grimorium Verum and the Grand Grimoireto see their kinship. By the way, if that sounded like one long quote, it was. It was from my introduction to the Papyri from an article in Llewellyn’s long-time-gone-now Golden Dawn Journal. So here’s just a tiny bit more, then we’ll get to Isis’ magical names. As noted earlier, the Papyri are recorded in Greek and Demotic Egyptian, a late form of the hieroglyphs. It is an interesting comment on the degree to which the Greek and Egyptian cultures mixed, at least in the magical communities, that some of the papyri are recorded bilingually — within the same working. The Deities invoked are from an international group of Pantheons, too, (mostly Greek, Egyptian and Hebrew, with some Babylonian, Zoroastrian, Scythian and Thracian thrown in for good measure). 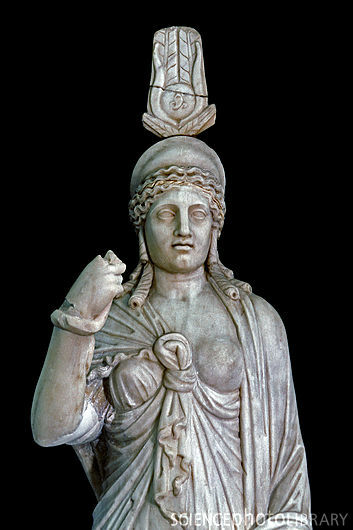 Hekate, in Her underworld aspect, is one of the most often-invoked Deities of the Papyri. Apollo and Selene as Sun and Moon also have many invocations addressed to them. Hermes Trismegistos and Thoth are invoked, but not as often as one might think given Thoth’s reputation as a magician. Isis is invoked often, not only in Her magician aspect, but just about every other aspect as well, as are Osiris, Anubis, and other popular Egyptian Gods. In relation to divination and prophecy, again, Apollo appears quite often. Interestingly, IAO is the most often-named Deity in the Papyri. We can recognize easily the names of the Greek Goddess Baubo and the Sumerian Queen of the Underworld, Ereshkigal, as well as IAO, the Greek version of Yahweh, and the Hebrew Godnames Tzabaoth and Adonai in this text. How many of the others are actually Deity names or epithets which were corrupted through scribal error or misunderstanding? “I call on you, Lady Isis, whom Agathos Daimon [“the Good Spirit”] permitted to rule in the entire black land. Your name is LOU LOULOU BATHARTHAR THARESIBATH ATHER-NEKLESICH, ATHER-NEBOUNI EICHOMO CHOMOTHI Isis Sothis, SOUERI, Bubastis, EURELIBAT CHAMARI NEBOUTOS OUERI AIE EOA OAI. Protect me, great and marvelous names of the god [add the usual]; for I am the one established in Pelusium, SERPHOUTH MOUISRO, STROMMO MOLOTH MOLONTHER PHON Thoth. Protect me, great and marvelous names of the great god [add the usual]. Qabalists will be interested to note that there are 22 magical names of Isis in this formula. (The other names are names of Thoth.) But I’d like to narrow down the list a bit for the sake of compactness and magical wield-yness. So I’ll remove Isis Sothis since its a fairly commonly known epithet of the Goddess. I’ll remove Nemesis and Adrasteia as well; these are Greek Goddess names that were applied to Isis in Her role as Justice Bringer. (Nemesis is a Goddess of retribution, especially Divine retribution, and Adrasteia’s name means “Inescapable.”) Neboutos may be a corruption of Nebetho or Nephthys, and though She is Isis’ twin, let’s remove that name for now. Athernebouni might (just a guess) also refer to Nephthys, but since it’s clearly parallel with Atherneklêsich, let’s leave it in. Bubastis is Bast, a Goddess in Her own right, so let’s let Her go Her own way. And finally, I think that Aie, Eoa, Oai, and maybe Asao and Eio, are magical permutations of (mostly) vowels rather than names. Wonderful, beautiful, and magical, such permutations are definitely part of Egyptian magic, but I won’t count them as names of Isis in this case. The only ones of these names about which I can even guess are Souêri and Ouêri. I think both are corruptions or mis-hearings of Weret, “The Great One,” which was certainly an epithet of the Great Goddess Isis. IsisIsis worship todaymagic and theurgyPagan SpiritualityRitualThe name "Isis"